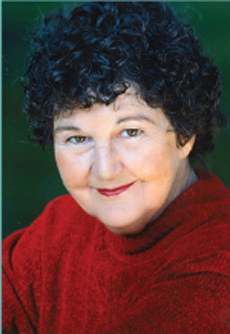 Hello, and thank you for visiting my website. I hope you find what you are looking for here. About me: I am a third-generation Californian. My family was big on education, so I did my undergraduate work at Occidental College and my graduate work at UC Irvine, receiving a doctorate with a thesis titled The Visionary Mode and Finnegans Wake. My writing career actually began when I was a child. I awoke one morning with an image for a poem coming to me in a burst of sparkly light. It was an image of a bluejay acting as Policeman of the Wood. I quickly composed it, and it later won a prize in the local newspaper and was printed there. That’s when I decided writing was for me. When I was at Occidental, a beloved teacher commented that my writing style had become “turgid.” When I asked him what he meant, he replied that I sounded like a graduate student, writing in long words with lots of jargon. Luckily, I rose above hurt feelings and decided that in the future, I would write as clearly as possible, so that my work would be accessible. I hope you find it so. My first adult book to be published is Out There: the Homeless Years. 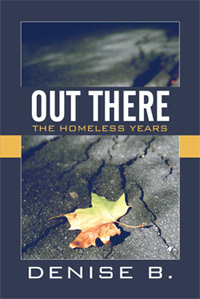 Based on a true story (my own), Out There is a work of documentary fiction that begins by tracing Dr. Dee’s descent into homelessness. We are with her as she discovers the Rules of the Street: how to panhandle, how to feed herself from dumpsters, how to run from fights, how to find places to sleep. We meet her cohorts and come to understand the world as viewed by street people. After chronicling her various adventures, the book shows her miraculous re-emergence as a professional woman who is able to reunite with family and friends and to cope with mental illness and alcoholism. We then know the meaning of her favorite tune: “As low as you go, that’s how high you can fly.” (There are two versions of this book, one by Denise Blue and one by Denise B. Both are written by me.) Price: $20. 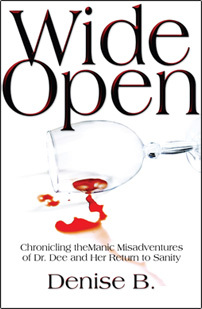 The next book is Wide Open: Chronicling the Manic Misadventures of Dr. Dee and her Return to Sanity. The book has two parts. The first is a non-fiction telling of what the manic state is like, showing both the full throes and the recovery. The second part is a mystery novella, which I wrote simply because I am fond of mysteries and wanted to see if I could write one. 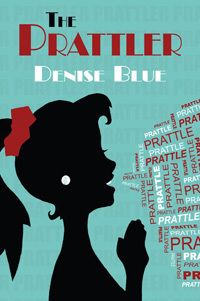 This book was published with the author name “Denise B.” Price: $15. Then came The Prattler, sequel to the first mystery. Both are local, being set in South Pasadena, my own home town, and San Marino, California, a neighboring city. In this book, a woman who talks non-stop about herself, driving her listeners crazy, is silenced for good. The puzzle of the killer’s identity is solved with the help of two elderly ladies returning from a church camp, Emily (our heroine), and two San Marino detectives. 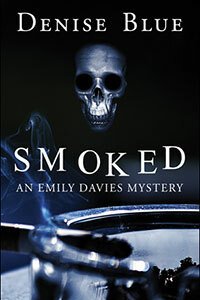 Smoked is the third mystery in the series featuring Emily Davies. While teaching spring semester at Glendale College, Emily discovers the body of a colleague. She promises the sister of the one who died that she will help the police find the killer. In the meantime, Emily continues to enjoy her companionship with Detective George Watts, and their romance blooms. Price: $15. Please specify which book(s) you are ordering and enclose check or money order & where you want them sent. Also enclose delivery charge of $5.